Donald Trump is the Voldemort of presidential candidates. 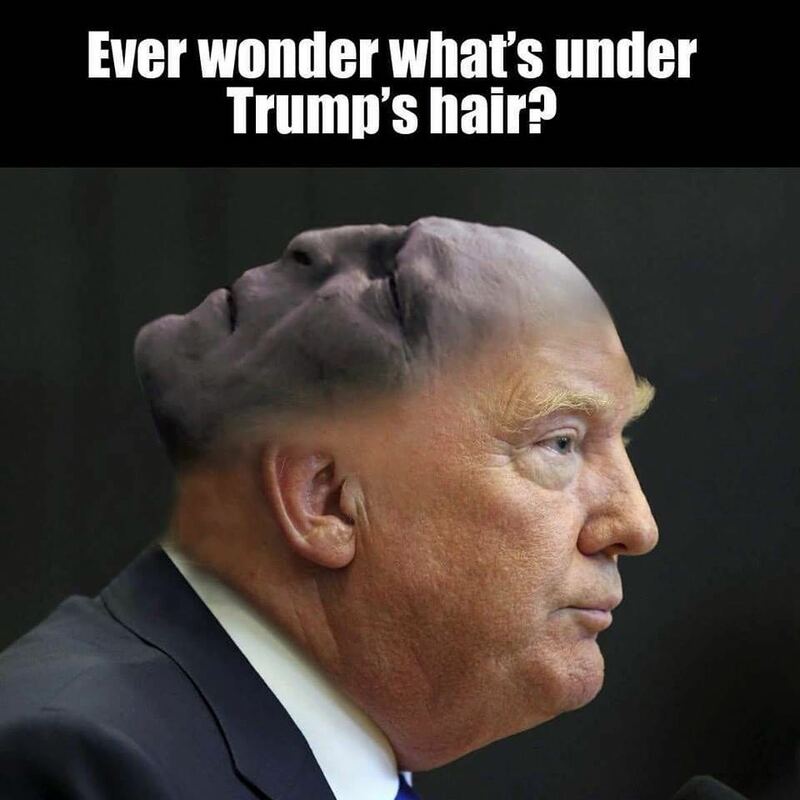 Now, wait just a minute (you might object): Trump has an elaborate coif, but Voldemort is bald! And Voldemort is well-spoken, while Trump uses the vocabulary of a fourth-grader! Both true. But Trumpy and Voldy otherwise have so much in common. Both built their political careers on scapegoating minorities. In his bid to make wizarding great again, Voldemort wants to expel Muggles and those of Muggle ancestry — even though he himself is the son of a witch and a Muggle. Trump — the son of a Scots mother and an American Klansman father — also likes to blame immigrants. Mexicans, he says, are “rapists” and “criminals.” Islam “hates us,” Trump alleges, and Muslims should be banned from entering the U.S. I support Hillary Clinton because she is compassionate, and has been throughout her career. Donald Trump cares only for Donald Trump. There are countless stories of Clinton coming to the aid of others, whether making sure 9/11 first responders got the help they needed, fighting for children’s health care, or sustaining a correspondence with ordinary citizens like Aleatha Williams — who, as a child, wrote to the then First Lady. Clinton kept in touch, attended Williams’ middle-school luncheon and high school graduation. It’s impossible to imagine Donald Trump — a man who attacked a grieving Gold Star family — doing anything of the kind. He has no heart. No compassion. No humanity. The whole essay is over at Dedicate Your No-Trump Vote, where you’ll also find great pieces by many other (much better) writers. Check it out! Make sure you’re registered to vote! And VOTE! Register to vote: at vote.gov! Ambiguous credit: I’m not sure who made the meme I’ve used at the top of the post, but it wasn’t me. Children’s literature is literature. Intelligent adults already know this. However, as those of you who study or write or teach children’s literature are well aware, the world is full of alleged grown-ups who insist on spreading the myth that children’s literature is not literature, and (thus) cannot be studied as such. A week or so back, journalist Alison Flood reported on a conference alleged to be “Billed as the world’s first conference to discuss Harry Potter strictly as a literary text.” Presumably, that’s a swipe at the fan-organized conferences, the first of which was (I believe) Nimbus 2003: The Harry Potter Symposium, held nearly 9 years ago. While fan conferences do discuss the books as literary texts, it’s also true that they cover other, less traditionally “academic” subjects. (Full disclosure: I’ve been an invited speaker at two of the fan conferences, including Nimbus 2003.) However, it seems a bit of a stretch to say that this was “the world’s first conference to discuss Harry Potter strictly as a literary text.” It was not. One suspects that Mullan and Flood would be surprised to learn that — in addition to the scores of books and articles about Rowling’s series — a portion of the manuscript for Harry Potter and the Philosopher’s Stone (Sorcerer’s Stone for American readers) is currently on display in the British Library, alongside works by Chaucer, Edmund Spenser, William Blake, Virginia Woolf, Samuel Taylor Coleridge, William Wordsworth, Kazuo Ishiguro, Ted Hughes, and George Eliot. Indeed, the exhibit — Writing Britain: Wastelands to Wonderlands — does not segregate children’s literature from “adult literature,” a decision which would likely distress Professor Mullan. In addition to Rowling, the British Library’s exhibit features Kenneth Graham’s Wind in the Willows, A. A. Milne’s Winnie the Pooh, J.R.R. Tolkien’s The Hobbit, Arthur Ransom’s Swallowdale, Susan Cooper’s Greenwitch, and Lewis Carroll’s Alice’s Adventures Under Ground (the book which, in revised form, became Alice’s Adventures in Wonderland). It also includes comics by Neil Gaiman and Alan Moore. It’s a fascinating, well-curated exhibit. Every night before he went to sleep, Harry ticked off another day on the piece of paper he had pinned to the wall, counting down to September the first. On the last day of August, he thought he’d better speak to his aunt and uncle about getting to King’s Cross station next day, so he went down to the living-room, where they were watching a quiz show on television. He cleared his throat to let them know he was there, and Dudley screamed and ran from the room. He pinned a piece of paper on the wall, thinking of the days before he went to September the first marked on it, and he ticked them off every night. On the thirty first of August he thought he’d better speak to his uncle about getting to King’s Cross next day. So he went down to the living room, where the Dursleys were watching a quiz show on television. Harry cleared his throat to tell them he was there, and Dudley screamed and ran from the room. The revisions to the above offer a glimpse into Rowling’s creative process. First, the original name for Harry’s owl was not Hedwig, but Widdicombe. Hedwig was a medieval saint. Widecombe-in-the-Moor is a town in Devon, England. Ann Widdecombe is a British Conservative Party politician; however, given the distance between Rowling’s views and hers, as well as the close relationship between Harry and his owl, the socially conservative former member of Parliament is likely not the inspiration for the character of Harry’s owl. The town is the most likely source because Rowling collects words she likes, including those from street signs — Snape’s surname came from an English town. The new name for Harry’s owl offers stronger thematic resonances with the character, a noble owl who endures much suffering on Harry’s behalf. The change to the original name also reminds us how carefully Rowling considers her characters’ names. As is the case with Dickens’ names, Rowling’s names often telegraph a key trait of the character. Third, I say that characterization comes more easily to Rowling (based on this admittedly limited sample) because she makes very few changes to the descriptions of the Dursleys. In both, they are “watching a quiz show on television,” which (for Rowling) signals their shallowness. Always rude to his nephew, “Uncle Vernon grunted to show he was listening” (in both). Still spooked by his recent encounter with magic, “Dudley screamed and ran from the room” (in both). How apt that Rowling should have greater facility with character. Though she has a fully imagined secondary world, key to readers’ enjoyment are characters to whom they can relate. Rowling’s debt to the mystery genre helps make her books page-turners, but she has such avid fans because she’s able to make people care about Harry, Hermione, Ron, Sirius, Ginny, Dumbledore, Neville, and others. I concede that my off-the-cuff analysis of a few textual differences could be more robust. But my larger point here is that of course Harry Potter can be — and often is — the subject of academic analysis. Indeed, for roughly a dozen years, it has attracted a great deal of attention from literary critics. If we are interested in the craft of the most popular and influential writer of her generation, then it’s worth taking J. K. Rowling’s work seriously. If we care about the adults today’s children will become, then we need to take children’s literature seriously. Stories provide children with their earliest ideas about how the world works, and about what literature is and why it matters. Professor Mullan should care about books for the young because the children who enjoy reading are the ones most likely to grow into adults willing to read Laurence Sterne and John Milton. But we all should care about children’s books not merely because they help create literate grown-ups. We should care about them, study them, hold conferences on them, and write them because they are Art. I’ve managed to schedule two invited talks within three days of one another. I believe both are open to the public. The Johnson-Krauss talk (Normal, IL, 26 Mar.) definitely is open to the public, and the Harry Potter talk (Pittsburgh, PA, 23 Mar.) offers no indication that public needs permission to attend. So, if you’re in the area, stop on by! Here are more details. I’ll be speaking on “Harry Potter: A Cultural Biography” at 1:30 pm, in 324 Cathedral of Learning. This is part of a day-long Harry Potter conference attended by University of Pittsburgh students. Karin Westman is also giving a lecture, “Harry Potter and the Object of Art,” in the same location at 3:15 pm. You can learn more about the event on this University of Pittsburgh webpage. 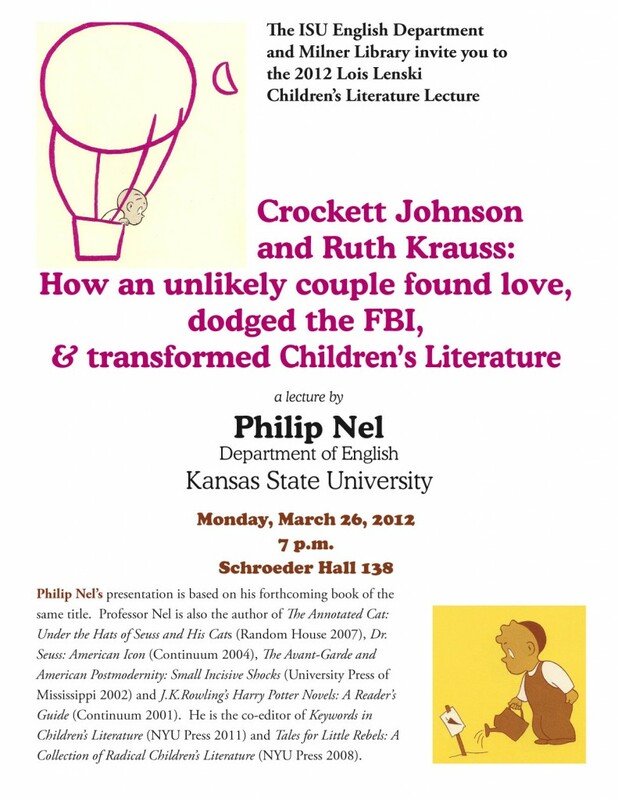 I’ll be speaking on “Crockett Johnson and Ruth Krauss: How an Unlikely Couple Found Love, Dodged the FBI, and Transformed Children’s Literature” at 7 p.m., in 138 Schroeder Hall. This is the spring’s Lois Lenski Lecture, and it will allow me to premiere what will be the “book talk” for my biography of Johnson and Krauss (which, not incidentally, has the same title as the talk). You can learn more about the talk here. They’ve got a spiffy poster for the event, too! Nine years ago, I started teaching a course I called “Harry Potter’s Library: J.K. Rowling, Texts and Contexts.” This coming fall, I’ll be teaching it for the seventh time (eighth, if you count the semester I taught two sections). The course has been so popular that Kansas State University uses it in its promotional materials. Faced with a high demand for the class, the English Department offers at least one section each year. Thankfully, my colleagues Karin Westman and Naomi Wood have also been teaching it (freeing me to teach other courses). Indeed, our current syllabus is a collaborative effort — and will likely change further before the term actually starts. 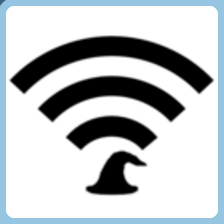 I’d like to incorporate some PotterMore, and arrange for a guest lecturer on Wizard Rock. It’s tempting to claim that the release of the seventh (and final) film next month will be a kind of milestone for this generation — the last dramatic adaptation of their beloved series. And it might be that. But such a claim suggests that it (the film) will serve as a sort of “concluding chapter” to a phase of their lives, and I don’t think that’s strictly accurate. A more accurate claim would be to say that, for many of this generation, the Harry Potter series constitutes a key portion their shared culture. In increasingly fragmented media world (websites! videogames! Facebook! Twitter! movies! TV! ), Harry Potter is one thing that they have in common — or most of them do, anyway. Even if they’re not fans of the series, they’ll know the basic references. The closest analogue that my generation has is Star Wars, and yet Harry Potter feels bigger than Star Wars. I haven’t studied this subject closely, but my sense is that the appeal of Harry Potter is broader than that of Star Wars. Fans of each are comparably devout, fond of dressing up in costumes, collecting memorabilia, having conventions. But I cannot think of anything comparable to, say, Wizard Rock in the Star Wars fan community. 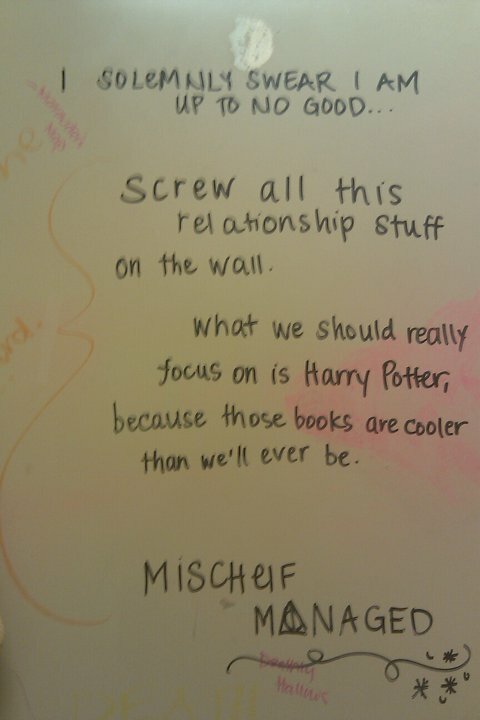 For a variety of reasons, Harry Potter has permeated the culture much more thoroughly than just about anything else. 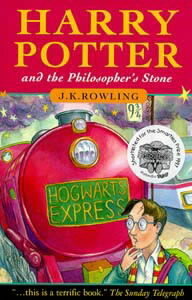 What the Beatles are to popular music, Harry Potter is to children’s literature — and, indeed, to popular culture. In the first chapter of the first Harry Potter book, Professor Minerva McGonagall predicted that the infant Harry Potter “will be famous — a legend — … there will be books written about Harry — every child will know his name.” Rowling could not, then, have known how prophetic that statement would turn out to be. Well. Back to the course. The structure, each time, has been roughly the same. Part I: Antecedents and Influences. 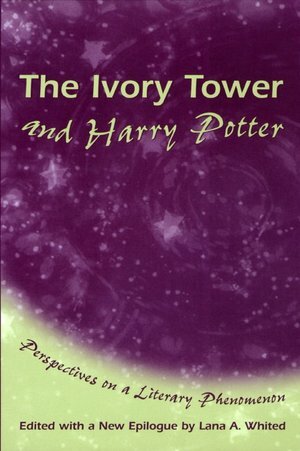 Part II: The Harry Potter series (plus some critical articles on it). Part III: Contemporary British Fantasy. But the particular texts have varied. Sometimes, for Part III, we’ve done the entire His Dark Materials trilogy. Diana Wynne Jones and Eoin Colfer have also made appearances in Part III. Lately, we’ve been doing Pullman’s book 1 (The Golden Compass) with book 1 from Jonathan Stroud’s Bartimaeus trilogy. The class pulls in people from all over the university — we’ve had students from just about every major. Since the total number of credit hours already taken determines when a student gets to enroll, most of the students are seniors — many of whom, they tell me, have been waiting to take the class since they were freshmen. Lest readers of this blog post imagine that the course is “light,” take another look at the syllabus. 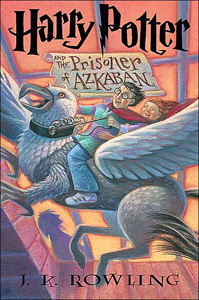 The Potter novels themselves run a total of 4,195 pages. When you add in the other novels and additional critical texts, that’s a lot of reading. Sure, most of the reading is fun. But it’s also work — the rare work that is also enjoyable. Happily, students who enroll in the course tend to be dedicated and (thus) do not complain about the heavy reading load. And, over the course of the semester, they come to understand that it’s fun to take children’s literature seriously. It is fun. And showing people the fun of taking children’s books seriously is one of the reasons I do what I do — teaching and writing about literature for young people. 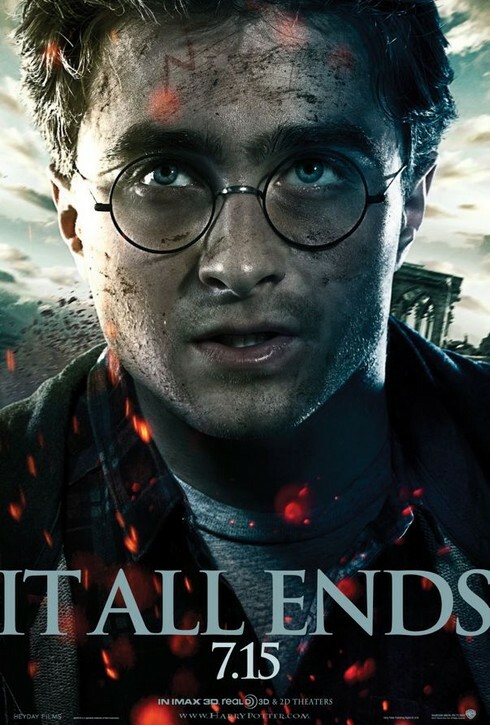 In advance of the film’s release, Kansas State University’s Media Relations asked us to talk about Harry Potter and the Deathly Hallows. We did. They taped us, and edited the results down to 3 minutes. Karin is on the right. And that’s me on the left. They also put out a news release on Friday of last week. And no, we have not seen the new film yet either. Looking forward to it, though!